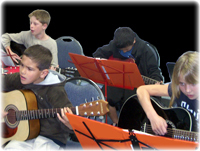 This guitar class is designed for students to get an introduction to and a fundamental understanding of guitar. The course is great to way to determine the interest level of the student and prepare for private instruction. Curriculum is provided by the academy. A video of each class is posted to our companion site, LessonRewind.com, so each student can review it at home, or if the student must miss a class he/she can watch it from home and therefore never miss a class.